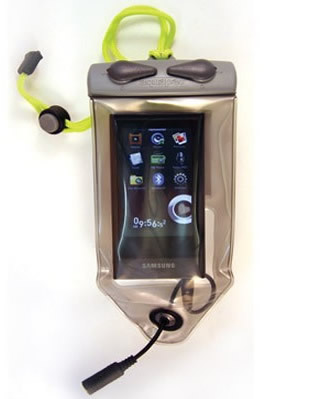 Aquapac Waterproof iPod Case for Waterproof MP3 Players. The New 2011 Aquapac underwater MP3/iPod case offers guaranteed 5 year warranty for 100% waterproof protection for your unit keeping it safe. The Aquapac underwater MP3 case is designed for use in and around water and has been professionally tested by the British Standards Institute. You can operate the controls and click wheels of your iPod right through the case. 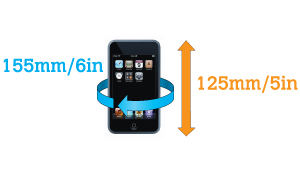 The underwater MP3 Case will fit the majority of phones and GPS units. It'll float with your iPod in it. The UV-stabilized TPU material won't be broken down or discoloured by sunlight. It keeps out dust and sand too. Compatible with H20 Audio, Overboard and Aquatunes waterproof headphones. It comes with a adustable cord so you can hang it round your neck. An Armband allowing you to strap the case to your arm or your equipment - so you can enjoy your activity hands-free. The Aquapac 5-year global warranty. How have you improved this case in 2011? It's softer and more malleable. Making it even easier to operate your iPod controls through the material. It'll perform much better if you want to take it somewhere really cold. It'll still be soft and malleable at -40º and below. It has a greater tensile strength, meaning it's even more difficult to tear or rip apart. The underwater MP3 Case designed for the original iPod but will fit the majority of iPods and MP3 Players. We recommend you use Overboard Headphones with this case.